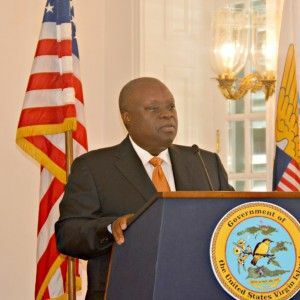 FREDERICKSTED, St Croix, USVI - USVI Governor Kenneth E. Mapp on Friday June 17, 2016 announced the appointment of Judge Harold A. Willocks to serve as presiding judge of the Superior Court of the US Virgin Islands. Judge Willocks will replace current Presiding Judge Michael C. Dunston. The governor’s move might be without precedent, as it’s extremely rare that a governor, aside from appointing judges, becomes involved in matters of the judicial branch of government. The governor cited Virgin Islands Code Title 4, Chapter 71, which he says gives him the authority to replace Judge Dunston with Willocks as presiding judge. But the law, while clear on the ability of a governor to appoint a presiding judge, does not say that a governor can remove a judge from the position without the term of said judge being expired. Judge Dunston will retain his tenure as a judge of the Superior Court until September 26, 2019, according to the governor. Judge Dunston’s last day as presiding judge will be June 26, after which Judge Willocks will commence his term as presiding judge. The governor said his decision to replace Judge Dunston was based on the slow pace in which cases go to trial in the Virgin Islands. He said the Superior Court lost millions while attempting to computerize its system, and still remains out of sync in an age of technology. Amplifying the problem, Mr. Mapp said, some judges were failing to report to work. And while the federal judiciary has offered the Superior Court access to use its system for little to no fees, the Superior Court had yet to utilize the offer. “The Superior Court remains lethargic, non-functioning and simply, in 2016, a paper operation,” Mr. Mapp said. The governor added that in his attempt to “invigorate” the Superior Court to help it meet the demands of the 21st Century — including speeding up the trials of over 175 detainees at Golden Grove, some of whom have been waiting over three years — he would transmit a bill to the Legislature calling for what is dubbed a Virgin Islands Speedy Trial Act, “that will require when persons are arrested and charged with criminal offenses in the Virgin Islands, that their day of reckoning in the court is understood and clear,” Mr. Mapp said. The territory’s leader said that the G.V.I. is spending “huge monetary resources” to house, feed and provide medical service for detainees while they await trial. “This cannot continue,” he said. The governor also noted that his concerns were not only with the unhurried pace of the docket, but also civil matters, including conflicts with contracts and businesses, which he suggested have affected the manner in which the economy operates. And he also confirmed his support for provisions of a bill making its way through the Senate that seeks to unify the Superior and Supreme Courts of the Virgin Islands. That same measure includes a provision that would strip away the power Mr. Mapp exercised today. Instead, the law, based on the federal system, would call for the rotation of judges withing the Superior Court every three years, based on seniority, to be the presiding judge. The governor then addressed the crime problem the territory has been facing, stating that his administration remains undeterred in its efforts to secure safer communities for residents. “We remain very serious in our efforts to bring crime under control in the territory. We’re investing millions in our police department, our department of justice, we’re spending millions to bring the consent decree and the requirements of the Bureau of Corrections in order, and it is important that a significant provision in the criminal justice process, that of the court of the Virgin Islands, be brought up-to-date, modernized and be able to respond to our needs within this community,” the governor concluded.